HABIT: Inconspicuous flowers in spring. Clusters of red berries on female trees in late summer. Fast growing shade tree with open structure, yellow, red, and orange fall color – sometimes all at once. Compound leaves with 10-16 paired leaflets. Light, smooth bark when young. Branching structure is poor when young but quickly fills out. CULTURE: Easy to grow in any well-drained soil, drought tolerant. USES: Shade tree, fall color. PROBLEMS: Tip growth sometimes burns in early summer from too much water. The female trees tend to yellow and get weak looking in the late summer as the fruit ripens. A very large percentage of these trees are planted too deep in the ground and havve circling and girdling roots. The root flares should be exposed with the Air Spade and the choking roots removed. NOTES: Incorrectly called Chinese pistache. One of the best fast growing trees. Native to China but acts like a native Texan. 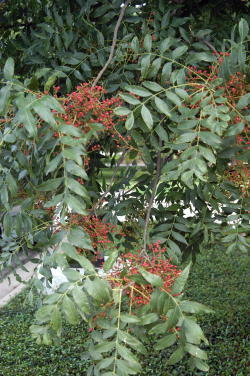 Pistacia texana, the evergreen Texas pistache, is native to South Texas. Has some freeze problems in North Texas. Looks more like a big shrub than a tree. Normal height is 15’-20’ but can grow to 30’ or more. The pistachio that produces the delicious nut is Pistacia vera, a desert plant that can’t take much water at all. This information comes from the Dirt Doctor's newest book, Texas Gardening - The Natural Way. CLICK to purchase.